HÀ NỘI — People in 14 provinces across Việt Nam will get access to various financial products and services in the next three years. Seventy-five People’s Credit Funds (PCFs) in the provinces will receive support in developing financial products and services from now until March 2021 through a collaboration project with Canada. The project on strengthening the PCFs network, known as the STEP project, was launched on Wednesday morning in Hà Nội. Its goal is to strengthen the capacity of the Cooperative Bank of Vietnam (Co-op Bank) and its network of PCFs by providing them with support and advice in the areas of credit and risk management, new financial products and services, information technology and internal control, as well as governance, gender and environment and safety fund issues. The project is funded with CAD17.7 million (US$13.9 million) by the Canadian government. It will be carried out from now until March 2021 by Co-op Bank, in collaboration with the Canadian organisation Développement international Desjardins (DID). It targets the PFCs in Hà Nội; four northern provinces of Hưng Yên, Hà Nam, Hải Phòng and Ninh Bình; three central provinces of Thanh Hóa, Nghệ An and Hà Tĩnh; and six southern provinces of Đồng Tháp, An Giang, Kiên Giang, Cần Thơ, Sóc Trăng and Trà Vinh. Speaking at the launch ceremony, Trần Quang Khánh, chairman of Co-op Bank, said that the project will greatly contribute to the process of sustainable rural and economic development of the country. “By helping the PFCs to diversify financial products and services, the project will provide people in rural areas with direct and comprehensive financial access and more employment opportunities,” he said. As a head unit of the nationwide PFCs network, Co-op Bank will do it best in rolling out the project’s activities to the network members, he added. 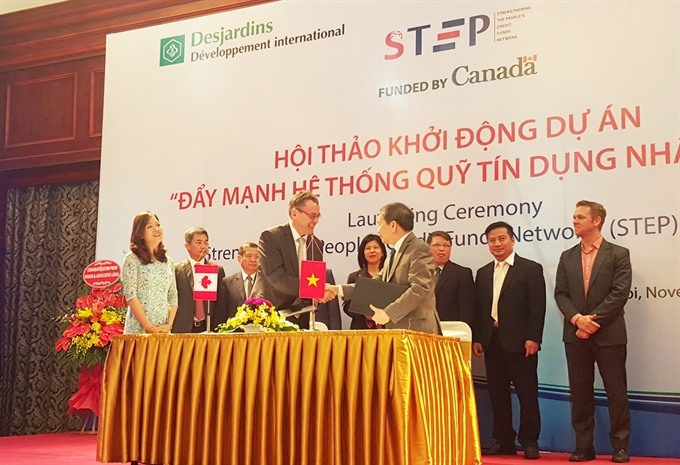 Ping Kitnikone, Canadian Ambassador to Việt Nam, said that the Canadian government is proud to continue to support Việt Nam in providing access to financial services to rural areas. “I am pleased to see that the Vietnamese Government has recognised the importance of financial inclusion,” she said. “An active and stable banking system is an important foundation for sustained economic growth that affects all citizens,” she added. A people’s credit fund is a type of cooperative credit institution operating on the principles of voluntary participation, self-management, and self-responsibility for its operating results, fulfilling the basic objectives of providing mutual assistance between members to develop the strength of the collective, according to the Việt Nam Economic Times monthly newspaper.